How do I turn on the background lightening? The background lightening can be turned on by pressing the left and the right button on the bottom together. When am I entitled to make a warranty claim? You can make a warranty claim in relation to material and workmanship defects. The warranty does not cover batteries, wear-and-tear parts, wear caused by commercial usage, or accidents. You are only entitled to make a warranty claim if the SIGMA product itself has not been opened without authorization and the receipt of purchase is provided. The watch is water resistant with a standard of IPX8. Are there different wristband sizes? The watch only comes with its attache wristband. Thanks to its many setting options, it fits every wrist. What is my watch’s battery life? The battery service life lasts according to its usage approximately 10-14 days. 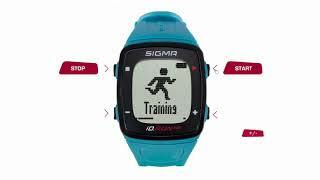 Can I evaluate my trainings with the SIGMA Data Center? The watch can be connected via USB to your computer. After that, you can transfer your trainings to the Data Center. Does the watch have NFC? The watch contains a NFC interface. 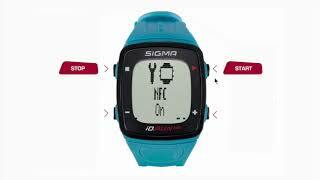 It can be used for a wireless data transmission to the SIGMA Link App. 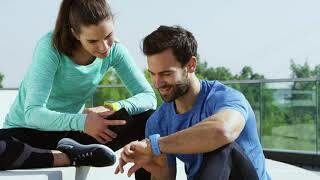 How does the iD.Run HR measure the heart rate? The iD.Run HR uses a PPG sensor to measure the heartrate.